Did you collect your candy in a bucket? If so, turn it over (when it’s empty!) and start playing your Halloween drum. Looking for drumsticks? Did you get any pencils? If you got the sort with erasers on the end (or if you got any erasers with holes for pencils) then try using the pencil end and then the eraser end and listen out for the difference in sound. If you have more than one little trick or treater who collected a can of pop they could both try tapping the sides with their pencil- (or lollypop-) beaters between sips to see who has the most left in their can. Listen out for the difference in pitch: a lower sound = more drink left in the can. How about one of those mini slinky plastic springs? I tried stretching ours over small tub and using it as a sort of guiro/scraper. You can play it with your pencil or fingernail. NB. A container with rounded corners is useful for keeping your spring in place – you could also try taping it down if it keeps popping off, although it’s fun to experiment with the sound as you alter the stretch of the spring. My kids got a good variety of bracelets, stamps, stickers and tattoos. For young children still struggling with knowing their right from left, you can use any of these things to help mark the difference. It can sometimes take quite a while for young pianists to get the hang of their finger numbers. Dollar store rings can be a fun way to help with this. The simpl est activity is to challenge your kid/student to put a ring on (for example) left hand, finger 4 (or one on each of their finger 4s to help with the concept of the hands mirroring each other). You can do one finger at a time, or try to build up a whole hand covered with rings – kids with magpie-like tendencies enjoy doing this with a collection of colourful/shiny toy rings. For my beginning students I put together a simple version of Mary Had a Little Lamb using rings to help identify which fingers to use. You can grab a copy at the bottom of this post if you’d like. This is another activity that you can do with stickers or stamps – stamping or sticking something on the sheet music and then putting a matching stamp, sticker or colour on the corresponding hands and fingers. Did your trick or treaters collect any glow sticks/jewellery? How about challenging them to play the piano in the dark with just the light of their accessories to give them the occasional clue (or stop them from getting spooked)! Yesterdays post included a printable composition sheet. We found some cute little pumpkin stickers which could be used to make a composition that lasts a little longer than the candy version! You could use them for dictation activities, too. I love those little pots of Play-Doh as a Halloween treat/loot bag staple. Try pushing finge rs into the dough to practice using tips of fingers rather than pads (making circles rather than ridges) and strengthen fingers. To make it more piano-specific you can flatten out a rectangle and score lines for the edges of piano keys and practice legato and staccato techniques. You can also work on rhythmic values and patterns with rolled up dots and ‘sausages’ of dough. Some kind people give out toothbrushes and dental floss in our area. I guess these are best used for the intended purpose. If you don’t need them you can always pack them up with some other essentials (and treats) and see if they can be used at your local hospital or homeless shelter (or cut out the middle-man and hand them over next time you pass a homeless person). Of course, I can’t resist adding my musical spin…if you’re about to bin an old toothbrush, you could consider re-purposing it as a drumstick/brush – we made witches’-broom sound effects with paint brushes in our Kindergarten music class last week, but a toothbrush would make a somewhat sturdier sound! And dental floss could used to make a harp or even string a guitar! I have a packet of dental floss that my youngest unwound while I wasn’t looking so maybe that’s best used for music rather than mouths! … here’s the Halloween printable for beginner pianists I mentioned above, the clip art isn’t by me – I’ll add the credits to comments. If you don’t happen to have rings in the colours or designs I’ve used, you can cut out the little pictures at the top of the sheet and stick them onto rings (or directly onto fingers). Alternatively, a dot of washable pen in the appropriate colour will do. Slightly older children will probably be able to follow without using rings/colours anyway. I personalised my copies with the names of my students; I’ve left a blank space for you to do the same. 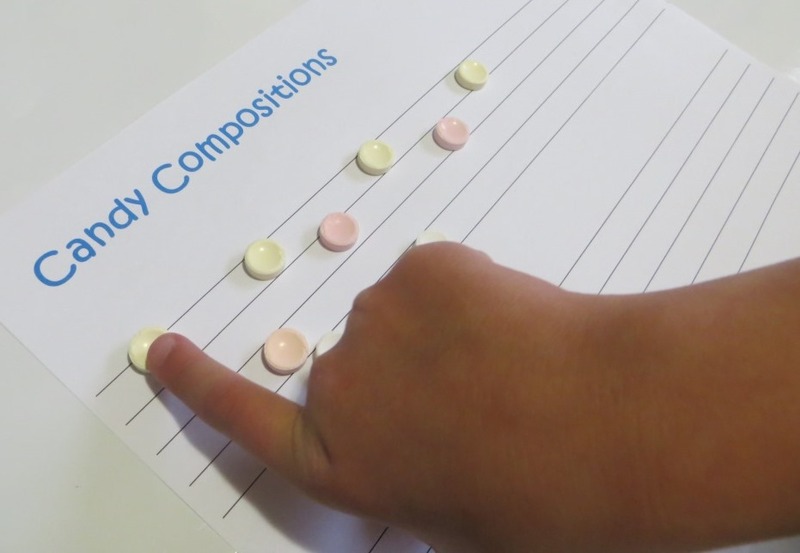 Draw an extra-large sheet of manuscript paper and use Rockets, M&Ms or any small candies to make musical notes. For beginners you can simply practice placing notes on lines and spaces. You can also compose your own short pieces or play a dictation game with one person singing a melodic pattern for the other to arrange on the staff. Feel free to grab my printable from the bottom of this post to try this at home. Rock ets are a great shape for little hands to get used to the feeling of playing with the tips of fingers rather than the pads. Play around with tapping on the candies and pushing them around to try and get those fingers muscles working – you could try and select different colour candies for different finger numbers. This is such a useful activity for early maths skills, too. I fondly remember the days when my daughter used to call Smarties ‘shakins’, because we cruelly let her believe that they were percussion toys rather than sweets. Smarties, Nerds, Milk Duds… anything that will rattle or roll around in a box can be used to shake along to the beat of the Monster Mash… Even any crisps/chips that got squashed at the bottom of the candy stash can join the rhythm section! And if you got a can of pop along the way – there’s your drum right there. Make use of those lollies as beaters. I wonder if it is possible to get through the summer break without feeling some degree of guilt or inadequacy about how we are spending our time. I’ve seen magazine articles claiming that facilitating too many activities for children damages their ability to function independently… and I’ve read advice from educators on steps we should be taking to halt the ‘summer slide’. I’ve clicked on comforting blog posts celebrating carefree and unstructured summers… and I’ve marvelled at pinterest boards and facebook feeds full of fabulous crafts and amazing excursions. As with most things, I guess the key is to find the right balance for your family (and your sanity!). Luckily there are many ways to make music a part of your summer fun with very little planning or extra effort, so this week’s posts will focus on quick ways to provide some musical moments. Today – echoing. This is something you can do at the breakfast table, in the car, at the checkout… or at the piano or somewhere more ‘musical’ if that’s where you happen to be! All you need to do is sing a short phrase – anything from a couple of notes to a line or two of a song and get the children to sing it back to you. You can sing to ‘da, da, da’ or ‘la la la’; sometimes I’ll throw in some solfege names to see if the kids parrot them back without realising that I’m sneakily trying to teach them something. For some variety (or if you don’t feel comfortable singing) you can also do this with clapping or tapping rhythms. So far playing echoing games has proven to be a good distraction when my little lot start bickering (and it’s also a great way to make use of those times when the children decide to play the HILARIOUS ‘copying everything I say’ game). Plus, as I increase the length or complexity of the phrases I sing to the kids the thought occurs that, along with prolonging our musical playtime, I might also be helping them prepare for any pesky aural exams that might crop up in their future. Result!